Description: USB to RS-232 or RS-422 or RS-485 levels serial UART converter cables. The converter cables are a family of USB to RS-232 or RS-422 or RS-485 levels serial UART converter cables incorporating FTDI’s FT232RQ USB to serial UART interface IC device which handles all the USB signalling and protocols. 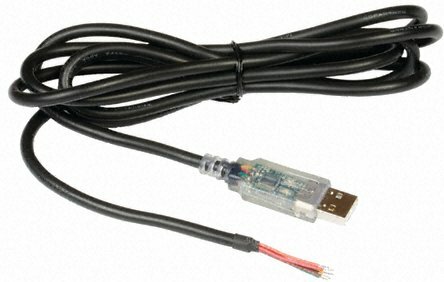 The cables provide a fast, simple way to connect devices with a serial UART interface to USB. The Chipi cable uses the FT231X device. Each converter cable contains a small internal electronic circuit board, utilising the FT232R or FT231X, which is encapsulated into the USB connector end of the cable. The integrated electronics also include the RS-232 or RS-422 or RS-485 level shifter plus Tx and Rx. LEDs in the transparent USB connector give a visual indication of traffic on the cable. The other end of the cable is bare, tinned wire ended connections. Optional power supply output on the Red wire is either zero or 5 Volts.